Whether you are moving to Skokie, welcoming a new family member, or combining households, Metro Self Storage is here to help. We offer pristine storage units in a modern, climate-controlled building. A small budget-friendly 5X5 storage unit is ideal for seasonal items or a decluttering project. However, if you need more than 25 square feet to get your home or business in order, we can help with that too. We offer ground level and second-story climate-controlled storage units in a wide variety of sizes ranging from 5X5 to large 10X30 commercial units that are ideal for storing an entire household of goods and furnishings. Our medium storage units start with the popular 10X10 and offer you a great selection of features such as high ceilings and motion sensor lighting. All Metro storage units come with state-of-the-art security systems and options for tenant insurance. Flexible month-to-month leasing gives you the benefit of storing your items for any length of time you decide and online bill pay makes managing your storage simple. Are you looking for cheap storage rates near the suburbs of Evanston and Skokie? Don’t miss our great online storage promotions and prices! Is your business in need of extra space? If your company could benefit from renting commercial space in Chicago's near north suburbs, Metro offers bottom-line friendly commercial storage units for rent in Skokie with 24-hour state-of-the-art security. Our ultra-clean commercial storage units are housed in a 100% climate-controlled building with multiple access points. Covered loading and unloading, wide driveways, electronic keypad access, and flexible month-to-month leasing can give your business a boost and you a peace of mind. Our Skokie storage facility provides you with a professional business storage team to give you the ultimate in service and convenience. 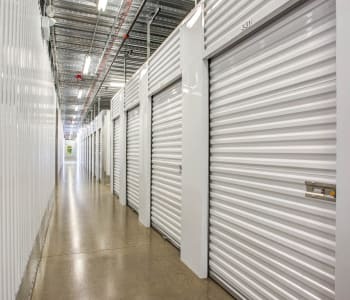 We invite you to call our storage experts for more information about business storage units in Skokie near the suburbs of Evanston and Lincolnwood. GO LOCAL. CHOOSE METRO SELF STORAGE. Supporting locally owned businesses helps to build community, and when you choose Metro for your storage needs, you will be working with a storage team who understands the Chicago area. Moreover, our Illinois-based storage company offers more than 40 years of experience and continues to uphold its reputation for providing clean and secure storage solutions with super-friendly customer service. Situated on the border of Chicago in the suburbs of Evanston and Skokie, our newly renovated storage center offers state-of-the-art 24-hour digital surveillance and a wide variety of climate-controlled storage units to meet a growing demand of storage needs for Chicago’s most popular cities and neighborhoods. Whether you are running a business near Lincolnwood Town Center, Evanston Center or living in Winston Towers, Metro Self Storage is centrally located to make your storage solution a simple one.